HI Bob & gang. Been in the hobby 40 years. 3 months ago set up my 220 reef. I was looking to replace my old metal halide/CPF lighting due to heat and costs and went with 3 new Kessil 360 WE blue LED's. I did an accelerated cycle with seeding sand and live rock with introduction of a very light bio-load and gradual increases. Skimmer in sump and macro's to in tank and below and just replaced my old Tunze wave maker with a new unit so everything is happy and thriving. 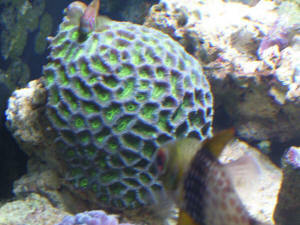 Recently acquired a Favites pentagona red war coral and would like to place it on an upper rock perch just about 4-5 inches below the water surface directly under one of the new LED's. I read they like good to moderate lighting are found in shallow reef lagoons so it appears this might be ok as long as I make the move gradual as far as bringing up toward the light correct? I also have a Devils Hand soft coral that I would like to place about 2 feet beneath the surface were the Favites is now. Your involvement and passion for the hobby as well as the well-being of life in our watery eco systems amazes me. I'm sure that I can speak for many who are envious..... you have been able to make your hobby and passion your everyday job to an extent and even beyond. We all hope you never lose that passion. Speaking of which I read you have primarily gone to fancy goldfish at home. I can understand that perfectly. I threw some fancy fantails in a 55 gallon tank a few years ago and put a trickle filter/sump return on it and about March when the sun started to get more intense they spawned. Removed some of the eggs and raised the larvae and it was a blast. I always wanted to put in an outside pond using a flexible liner and a split waterfall carefully landscaped with native limestone boulders and small plant like Lace Leaf Japanese Maple etc. only wife has not liked that idea. Too bad because I have a west facing slope next to my house on the east side that would be perfect for the split falls and 2 tiered pools. Unfortunately my wife has stage 4 colon cancer and treatment is not going well after fighting this for a year. I would gladly give up the pond idea to keep her but I may get my wish after all in the end but I'm sure she would like it unfortunately she never liked me spending money on the hobby. It was a lot less expensive that collecting cars though I can tell you that as that was my other passion. Maybe when I'm 70 something and get ready to slow down I can enjoy something like that. Yep we will all be sitting around in our rocking chairs someday. I just hope the home that I am in has a fish tank with a little of God's gift to us swimming around in it. I am terribly sorry for my constant questions that take up your time. However, I would like a professional opinion about two species of coral. The tank is 55 gallons, with two of these http://www.petmeister.com/item2131.htm . The lamps are one 10k and one 50/50 actinic. The coral in question are: Elegance Coral Catalaphyllia jardinei, and Lesser Knob Coral Cyphastrea decadia. Would I need to get a third light with only 10k lamp, or could I just elevate them in the water column? Turbo Snails, One Domino Damsel (Yes, I know it can be referred to as a monster), One Four-Stripe Damsel, One Percula Clown, One Jewel Blenny, One Pencil Urchin (for almost three years now! ), One Chocolate Chip Starfish (was informed about their taste for coral so it will NOT be residing in the tank much longer). I wouldn't be getting them for a while and before hand will make sure I can keep Mushroom and Bubble Coral, but the Elegance and Lesser Knob are my goal species. but I know my diamond back goby spreads sand all over the rock in the bottom quarter of the tank. This means the open brain would end up with sand on it. Is this bad? I also have a good flat rock shelf about one third of the way up, could I place it on this? What kind of lighting would I need to keep Favites spp. corals? but all of the other coral sites, such as LiveAquaria and reef hot spot, said they require moderate lighting. My tank is a 6x2x2 180 gallon with 2x 160W 6' VHO bulbs (one 10,000K and one 420nm blue.) Would replacing the 420nm blue bulb with another 10,000K white bulb increase my light intensity, having 2 whites instead of a blue and a white? I also use two 4' T-8 bulbs ( a white and a blue)set on timers for a dusk, dawn, and moonlight effect. I bought this a week ago. The polyps have not opened since. I'm not sure what to do to help the coral open up. It's close to some Ricordeas & hairy mushrooms & a new cap coral. <Not much useful system info present here so I do suggest reading here and related articles/FAQ's re your Caulastrea. I just got this coral which I think is a Favites. My question is does it matter if it is placed on rock or sand. I did not realize how long the sweeper tentacles are. That was a real display when I turned on my flashlight. I will have to move some of its neighbors out of harms way.